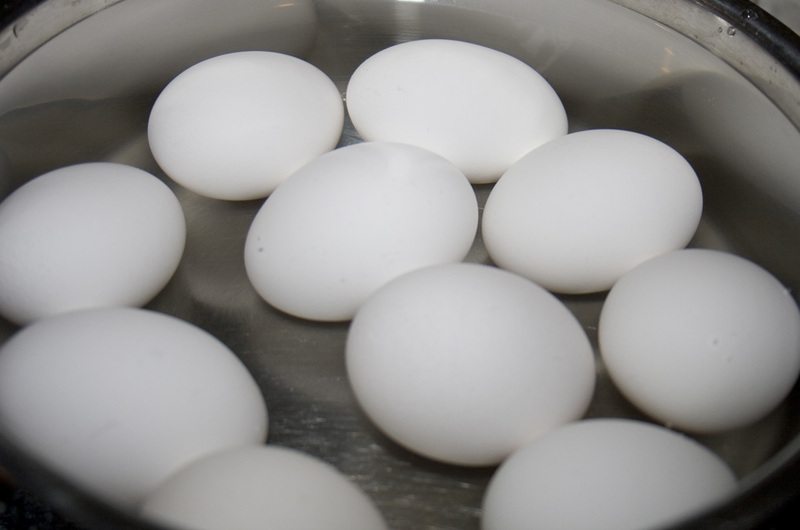 Easter Foods That Are Easier Than You’d Expect! Easter is coming! Here’s a round-up of some of my favorite springtime breakfasts, sides and desserts, perfect for your family get-together this week! Just click on the recipe title to be taken to the full recipe! Enjoy and Happy Easter! 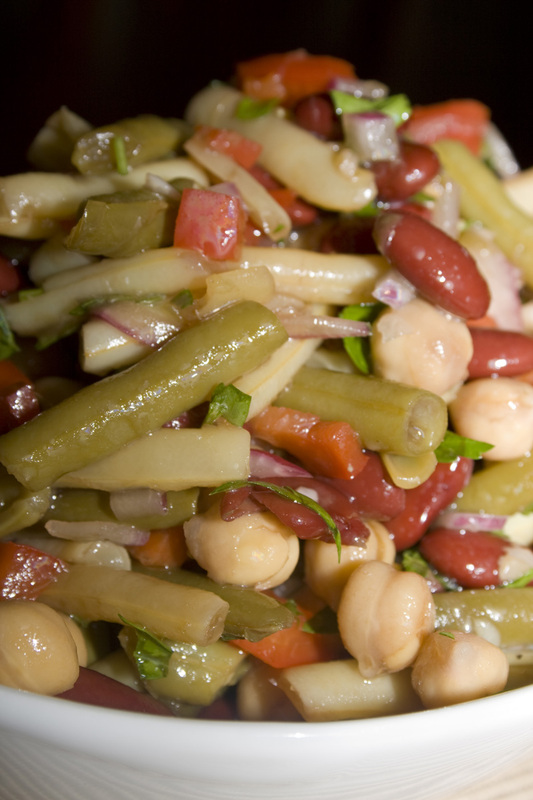 Full of bright colors, tang and texture, this bean salad is sure to be a hit at your next get-together. This salad requires a little time to hang out at the vinegar dressing dance party (aka: in your fridge), but if you know your way around a can opener, you throw the salad together in about 5 minutes. Why on earth would you buy the giant jug of this stuff at the store when making it yourself is so incredibly easy and delicious! Bonus, you won’t be eating a bowl of something that’s been salted and pickled beyond recognition. 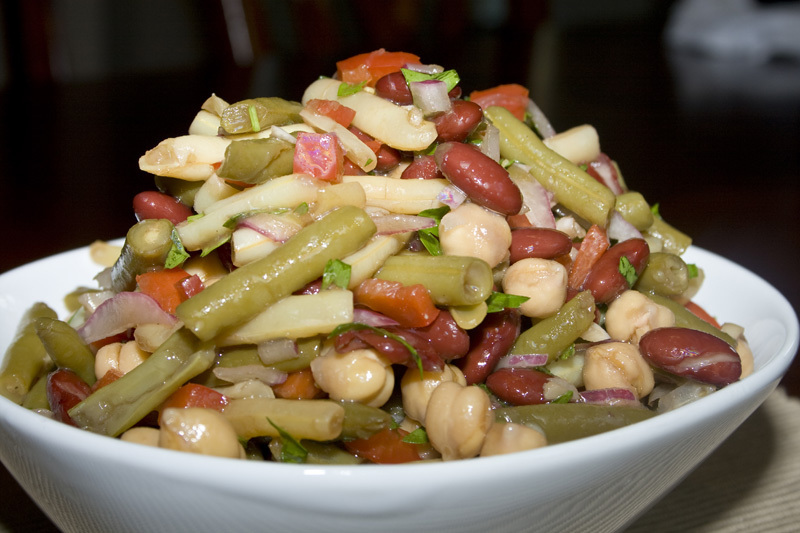 The trickiest part of this salad is finding the wax beans. You’ll find the chickpeas and kidney beans with the chili, northern beans and navy beans – in the bean aisle. But the wax beans and green beans will be together hanging out with their friends in the canned vegetable aisle. I don’t want to admit how long I spent scouring for yellow wax beans among the jalapeno pinto beans. Sigh. Does anyone else think “beans” no longer looks like a word? Drain a can of chick peas (garbanzo beans), rinse well, then drain again; place in a large mixing bowl. Drain a can of green beans and a can of wax beans well and then add to bowl. Drain a can of red kidney beans, rinse well then drain again; add to bowl. Dice up a colored bell pepper and add to beans. Peel a small red onion and slice into very thin strips and add to bowl. Lastly, add about 1/2 cup of chopped fresh flat leaf parsley. Now make dressing: in a separate bowl, whisk together the vinegars, oil, sugar (I use a scant 1/3 cup), minced fresh garlic, worcestershire, and salt and pepper. Pour dressing over salad ingredients and toss. Cover and refrigerate overnight, stirring occasionally (before serving, taste, as it may need more salt or pepper to taste). When ready, spoon bean salad into a serving bowl using a slotted spoon, to drain off most of the dressing before serving. I got this recipe out of a BHG magazine and I absolutely love it. 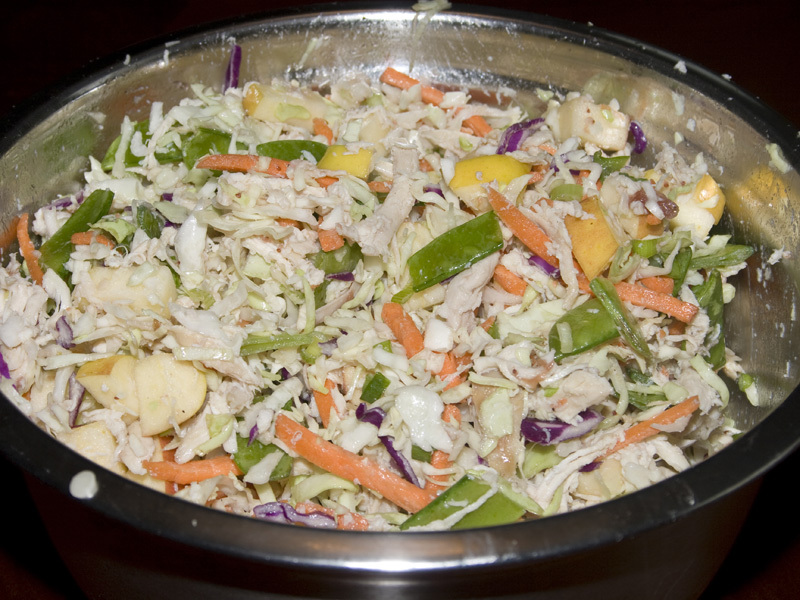 Kick up your standard boring coleslaw with the addition of sweet apples, tender chicken and a great dressing. It all comes together in a flash, perfect for the 4th of July and summer BBQ’s! This is also an incredibly light meal with less than 300 calories in about two cups of salad! Enjoy! 1. 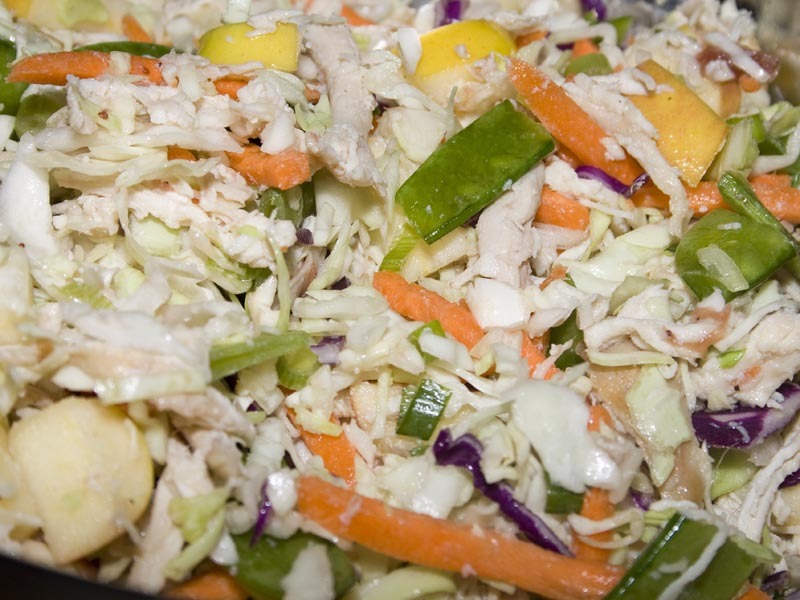 In a large bowl, combine chicken, cabbage, pea pods, apple and onions; set aside. 2. In a small bowl, whisk together spreadable fruit, oil and cider vinegar. 3. Add dressing to cabbage mixture and toss to combine. 4. Salt and pepper to taste if desired. Normally, I’m a meat, meat and more meat kind of gal. I have zero interest in becoming a vegetarian. However, in an effort not to become completely bored to death with turkey sandwiches (my standard lunch fare when trying to drop a few pounds) – I went searching for something new. I stumbled upon this recipe and thought to myself “Why not?”. I like garbanzo beans (chickpeas), but have never thought of them as a main ingredient for lunch. Hummus? Yes please! But a sandwich of garbanzos? I had to check it out.